The website was planned as source of information for bmw e36 owners. There are a lot of repare materials with photo manuals, description of car parts and intresting usefull tips on the website. All of them are open for visitors. As you can see, there are a lot of incorrect language constructions and hard mistakes on the website. The reason of all of this mess is that my own language is russian (I am from Belarus). 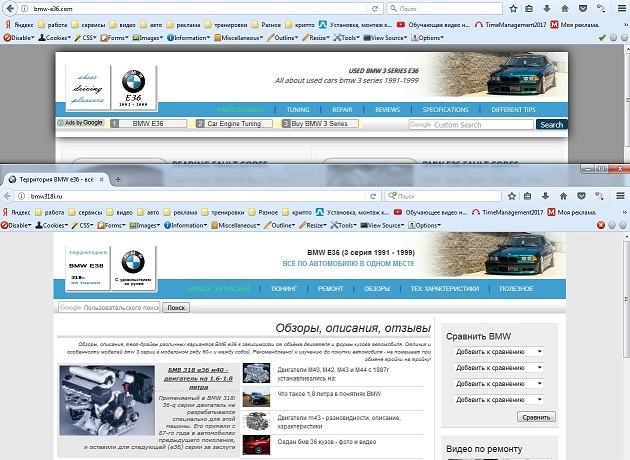 The bmw-e36.com is just an en version of my russian bmw318i.ru website. Russian version is more powerfull. There are a lot of video instruction, and more manuals “how to do …” on the russian website. But I hope I’ll find time to improve en version of the website in the neares future.